My book club friends and I have been participating in a Harper Collins program called Book Club Girls, which has provided us with a new book to read monthly. It culminated on Saturday in a Skype conversation with Lacy Crawford, author of Early Decision. First of all, I have to say that the opportunity to Skype with the author was an absolute treat. We had a blast spending an hour chatting with Lacy about everything from the book and its heroine to our various and sundry love lives. I have to admit that we were super nervous about how it would be to Skype, but it felt totally natural and the author was hilarious and so much fun to talk to - it was a complete pleasure! A huge thank you to Lacy Crawford for the chat and to Onalee and the folks at Book Club Girl who made it all possible! 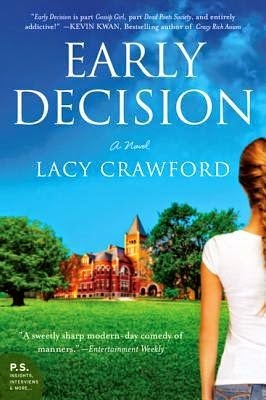 In Early Decision, debut novelist Lacy Crawford draws on 15 years of experience traveling the world as a highly sought-after private college counselor to illuminate the madness of college admissions. Working one-on-one with Tiger-mothered, burned-out kids, Anne “the application whisperer” can make Harvard a reality. Early Decision follows five students over one autumn as Anne helps them craft their college essays, cram for the SATs, and perfect the Common Application. It seems their entire future is on the line—and it is. Though not because of Princeton and Yale. It’s because the process, warped as it is by money, connections, competition, and parental mania, threatens to crush their independence just as adulthood begins. Whether you want to get in or just get out, with wit and heart, Early Decision explodes the secrets of the college admissions race. I have absolutely nothing negative to say about the quality of Crawford's writing. It's exactly what I look for in contemporary fiction: smart, funny, full of lovable and believable characters, and a plot that carries the reader along. I loved that Crawford avoided many of the tropes frequently found in this kind of book, particularly in the area of romance. It was a treat to read a book with a female main character who focuses on herself and doesn't wind up meeting someone cute and quirky with floppy hair to help her figure things out. The characters take center stage, not cliched genre tropes, which I greatly appreciated. So anything dealing with academia appeals to me right off the bat. I also had the privilege of attending an academically rigorous high school that placed a huge emphasis on college admissions. While I never had a private admissions counselor, I did spend quite a bit of time over the course of several years preparing for my college applications. I could identify with the pressure felt by the students as well as Anne's struggles in justifying helping the over-privileged. The high school students themselves are well fleshed out and completely believable as teenagers, which made the book even more of a delight to read. This is a great choice for fans of contemporary fiction, particularly those who enjoy women's lit that has less of a focus on families. It seems like we're either given chick lit or books about parenting, so it was refreshing to read a book with a main character my age who is contemplating her future career and life goals, but who is interested in more than dating and shopping. And while our main character isn't a parent herself, I think this will also appeal to those who are looking towards their own children's college admissions with fear and anxiety. I'd even consider recommending it to YA readers who are facing their own admission woes. It's got a wide range of appeal, it's smart, and it's funny - what else can I say? Thank you to Lacy Crawford, Onalee, and Harper Collins for providing me and my friends with copies to read and discuss!